Get ready for the best of both worlds. 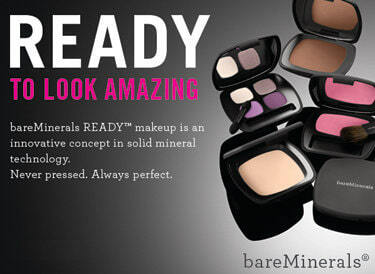 Bare Minerals Ready Makeup is a dream team of solid mineral makeup that is both kind to skin and portable. Incorporating a special SeaNutritive Mineral Complex and cold-pressed oils, the collection of eyeshadows, blushes, bronzers and touch up veils forgo parabens, binders, fillers and harsh chemicals for the revitalising benefits of pure minerals.